Bucharest Forum represents a major cross-regional platform for economic, strategic and social dialogue for decision makers in the region between the Adriatic, the Black Sea and the Caspian. Its formal objective is to meaningfully contribute to a stable and dynamic connection between Central Asia, Europe and the Levant following the logic of a New Silk Road. Bucharest Forum 2013 “Anchoring the New Silk Road, Linking Three Seas: Caspian, Black Sea and the Adriatic” is organized by Aspen Institute Romania and its partners: GMF US Black Sea Trust for Regional Cooperation and Adevarul Group and has the support of the Prime Minister of Romania and of the National Development Committee. Strategic, economic and human development challenges abound in the region and make the project daunting. The Western anchoring of the New Silk Road is part of that vision that links US and European security to Central Asia. Bucharest Forum is offering a place for intellectual debate on this topic, with the hope that inclusive and informed debate besets decision-making, investment and with these, stability and security in the region. The compelling narrative of regional cooperation, be it economic or political, is shaping the region, but significant obstacles remain to achieve common security and lasting stability required by sustainable and dynamic economic and social development. Some obstacles are related to protracted conflicts, others to competing perspectives on strategic, business and economic opportunities and, finally, others are linked to practical, legal and technological obstacles to mobility, trade and investment. 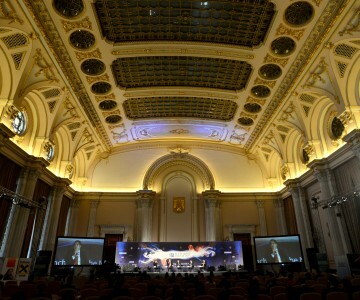 All these will be reflected by the Bucharest Forum 2013 agenda. The Silk Road: a historical network of interlinking trade routes that connected East, South, and Western Asia with the Mediterranean and European world, as well as parts of North and East Africa. The New Silk Road: an international web and network of economic and transit connections between Asia and the West, by building more rail lines, highways and energy infrastructure, upgrading the facilities at border crossings and removing the bureaucratic barriers and other impediments to the free flow of goods and people. The New Silk Road, as well as the Old one, is about connectivity and communication. It should be a superhighway built of both iron – and fiber optic cables. Setting a vision and plotting a course for the Western anchoring of the New Silk Road; a sense of priorities; setting common overarching objectives for the region. The region will remain a linchpin of European and Eurasian security for quite some time. This area is still affected by significant security challenges and conflicts that also limit economic development. US- Russian relations remain burdened by serious divisions on issues like the SMD. The EU has developed limited political instruments to cover this near-vicinity, in close competition with Russia over influence in the region. What are the short, medium and long-term cross regional security challenges that require an integrated perspective? What division of labor in the region? The panel will look at the issues from the prism of NATO reform and US-EU relations. The changing strategic framework, including the impact of the US Asian pivot, but also the ongoing crisis in the Arab and Muslim world, need to be considered. The original “New Silk Road” strategy proposed by the State Department derives from a vision of economic stability in and around Afghanistan post 2014. The only way to achieve this goal is through recreating a dynamic of development along the Silk Road going in both directions: East and West. That requires a new strategic approach to the entire region, where some of the problems transcend practical considerations, deeply rooted in philosophical approaches and historical behaviors. With a resurgent Russia and with a China increasingly active in the region, the classical West needs to redefine its objectives and vision. Historical considerations remain critical in this region neatly hugging the border between the Russian and Ottoman Empire, but they need not be a death trap. Meanwhile, US and EU priorities appear to lie elsewhere. What blueprint for making the New Silk Road a priority to EU-US strategic cooperation? Can EU and NATO enlargement still be an instrument to anchor the region? What are realistic scenarios for Central Asia between the West, Russia and China, or TTIP and Eurasian Customs Union? The panel aims to discuss the importance of a common, integrated or, at the very least, aligned transport and trade perspective for the region. At current, the regional transport infrastructure is fractured, and so is its set of domestic, bilateral and regional trade and customs arrangements. Investing in a strategy built on transport synergies in the region would lead to economic growth and development. The panel is imagined as an open dialog on economic trends in development of transport infrastructure along the New Silk Road. Particularly, it will focus on the conditions for its Western vector through the Three Seas Area (Caspian, Black Sea and the Adriatic). What are top priorities in investment needed to create the necessary physical and institutional infrastructure for trade along the New Silk Road? Proposed topics: rail and intermodal transport, financing of rail projects, the development of interregional, infrastructure and logistic hub, how to overcome trade and political barriers etc. What role for large economies in the region- the EU, China, Russia, Turkey etc? What role for European and regional development banks like EBRD, EIB, ADB etc.? Two sets of priorities: on one hand, aligning local infrastructure investments and, on the other, creating an overarching set of priorities matching large-scale cross regional strategic transport projects (for example EU’s TEN). 3. The Matrix of Success: How to Measure Investment Potential in the New Silk Road Countries? Even a thorough attempt to find the New Silk Road, or the Middle Corridor, or trade between Europe, Eurasia and Asia as subjects in the mainstream media, both regional and international, will not yield too many results. At the same time, the region itself is covered frequently, mostly depicted as the host of resurgent problems: poor governance, terrorism, illegal migration, energy, trafficking in drugs and people, emerging religious and ethnic conflicts, etc. Despite the significant economic potential of the region, the nature of the obstacles to a New Silk Road makes it of little positive interest for the media. The fact that no major institutional process covers the region does not help. The poor image is bolded by the precarious status of the media in the region. The panel will discuss both the future of the media in the region, as well as international coverage of the region. How can the topic of investment and development along the New Silk Road be made a mainstream subject, and bring a positive attitude towards the region? What should governments and business do? What is the main thing that drives mainstream media coverage? This panel covers top priorities for the region from a strategic view. The main challenge stems from a divided set of priorities of the countries in the region, and a focus on local combined with overarching political or strategic priorities. Creating room and appetite for an ambitious economic agenda that national governments, investors and business buy in is the main focus of this panel. Instead of looking at individual projects as such, it will attempt to draw a regional investment map and its connection with what takes place at both ends of the New Silk Road. The panelists will attempt to define the opportunity space between the ports of the Adriatic and the South China Sea. Between Italy and Japan, this area covers some of the most diverse economies in the world. The discussion will cover both the “what” and the “what for”, besides physical infrastructure (ports, LNG facilities, roads, railroads, pipelines) and virtual: information hubs, mercantile exchanges, trade delegations, we will look at what kind of products, goods and services would flow thorough the region. A year prior to the Sochi Olympic Games, relations between Russia and the West appear at a new low. The Syrian crisis has both deepened the divide and served as a catalyst for new rhetorical spirals. There is a deep rift in the economic and political perspective for the region when it comes at how it is seen form Brussels or Moscow. Russia and the EU are locked in what looks like a beauty contest, both political and economic, trying to lure the countries lumped together in the EU’s Eastern Partnership. The choice is between the DCFTAs on offer by the EU and the RBK Customs Union or the future Eurasian Customs Union. What do the actual economic trade and investment figures indicate? What is the political cost of doing business across the region? What is the realm of possible cooperative agendas and what lies in a fiercely competitive area? What are the requirements for a New Black Sea Political Agenda? What role for Russia? How does Russia see a Western New Silk Road strategy? What will it take to overcome frozen conflicts? What would a possible agenda for collaborative diplomacy look like? What are the main obstacles to trade & investment in the region? How can the legal and institutional barriers be overcome? What investment protection provisions are needed? How to build a set of common priorities in creating conditions for regional economic development and the expansion of regional trade infrastructures? In times of uncertainties on financial markets, what conditions for a New Silk Road investment compact? What should the governments in the region do to attract cross-regional investments? How to avoid the resource curse in the Caspian and Central Asian region? What role for privatizing public sector assets? What role for the major natural resource monopolies? A prerequisite of the economic development of the New Silk Road is the existence of a skilled, competitive workforce. At current, all countries along this Road are faced with a massive loss of workforce in general, skilled, in particular, to migration. The protracted conflicts have also created and are maintaining pockets of fake economies with extreme unemployment. The educational systems throughout the region also lack the vigor and freshness of those in developed countries, and national investments in research are minuscule. The panel will look at the opportunities for and obstacles against educating Silk Road boards and workforce. It will suggest elements of a strategy to create jobs, developing and retaining technically skilled individuals and companies. Is there a digital economy perspective for Eurasia? What would it take to get there? Traditional Silk Road was the quintessence of trade and manufacture, and they brought prosperity along its path. Can history repeat itself? Is there a role for manufacturing in the region? What is needed to achieve this role? Can trade networks and infrastructures be revived, at current modern standards? Can stock and commodities exchanges for the New Silk Road be created? The panel will look at bilateral and regional trade facilities, as well as national industrial policies nationally across the region. 1. Turkey’s Regional Ambition: A Promise or a Stumbling Block? 2. Can Trade Displace Energy in the New Silk Road Set of Priorities? Ilian Vassilev, Managing Partner, Innovative Energy Solutions Ltd. The recently announced TTIP promises to be reached through a complex, difficult and uncertain process, whose eventual success would have momentous implications of an integrated space for free trade that encompasses over a billion people and almost a third of global trade and half of the world’s GDP. Besides the two main actors of the TTIP, there are many others who will be affected by it. What is the impact for Eurasia of TTIP? What are the immediate implications of the current negotiations? Could this be both an opportunity and a reason to actively envisage its positioning on the trade map? The Silk Road has always connected Asia and Europe, but also the heart of Asia to the Levant. Current monumental challenges, including Iran’s relations with the West, the division on how to solve the Syrian conflict but also regional dynamics around Cyprus, Israel-Turkey, Azerbaijan-Iran etc. create serious difficulties for economic relations and flows in the region. What role can a dynamic East-West economic corridor playin shaping EU’s role in the greater Middle East? Constructing the post Post-Cold War perspective in Eurasia; the role of transformative leadership; women decision-makers’ influence in creating an innovative (public and corporate sector) agenda; the role of local and regional leadership networks; brain-trusts for knowledge sharing and policy development; the role of education for long term governance reform and grassroots societal transformation; cross-field collaboration and its international dimension; shaping the future of business leadership in the region. A wide variety of policy issues related to the quality of life and governance in the region will serve as examples from community management, to advocacy for at risk and disadvantaged groups etc. Constructing the post Post-Cold War perspective in Eurasia; women decision-makers; urban networks; academic networks.